Commander Steel (also Captain Steel) is the name of three comic book superheroes appearing in publications by the American publisher DC Comics, all members of the same family. The first Steel appeared in Steel, The Indestructible Man #1 (1978), and was created by Gerry Conway and Don Heck. His stories were set in World War II. The two later characters called Steel are his grandsons. Nate Heywood / Steel appears in Legends of Tomorrow, starting from the second season, portrayed by Nick Zano, while his grandfather Henry Heywood / Commander Steel was portrayed by Matthew MacCaull. Nate’s father Hank Heywood was portrayed by Tom Wilson. Steel first appeared in a series set in 1939, Steel: The Indestructible Man, written by Captain America writer Gerry Conway. The series was canceled after five issues, and Steel later made a guest-appearance in Justice League of America. Steel or Commander Steel also appeared in and was a member of the World War II era All-Star Squadron team. He made a prominent appearance many years later in four issues of the Eclipso ongoing series, where he was killed. After this, he appeared in issue #2 of the 2010 series, DC Universe: Legacies, which chronicled the superheroes of the 1940s. Starting in 1984, the second Steel appeared as one of the lead characters in Justice League of America, until its cancellation during the Legends crossover in 1987. He made a single appearance several years later in issue #38 of Justice League America, a continuation of Justice League International, where he was killed. In 2006, he played a leading posthumous role in a single story arc of JLA Classified, which chronicled a previously unrevealed adventure of the Detroit-era JLA. In 2010, he played a major role in the two-issue Justice League of America vol. 2 tie-in to Blackest Night, where he was temporarily resurrected. The third Steel made his debut in the 2007 relaunch of Justice Society of America, where he appeared for several years until the team was split into two separate groups by writers Bill Willingham and Matt Sturges, where he appeared as one of the lead characters in JSA All-Stars. In 2011's The New 52 reboot of DC's continuity, he is shown to exist on Earth 2, under the name Captain Steel. Steel, The Indestructible Man #1 (March 1978). Pencilled by Don Heck and inked by Al Milgrom. The World War II version of the character, Henry Heywood, enlisted in the United States Marine Corps prior to the United States involvement in the war, but was injured when saboteurs, spearheaded by the man who would become Baron Blitzkrieg, attacked his base. Heywood had been a biology student under the tutelage of Doctor Gilbert Giles, and his former professor performed extensive surgery on him, enhancing his damaged body with mechanized steel devices that gave him superhuman strength, speed, and durability. At the request of Doctor Giles, Heywood kept his newfound gifts a secret, and was returned to service in a desk position. Frustrated at his inability to help more directly, Heywood adopted the masked-hero persona "Steel", and was attempting to steal armaments from the military base where he worked—to send to those more directly in the war's fray—when some fifth columnist saboteurs broke into the base. Heywood defeated the saboteurs, and embarked on a career fighting foreign threats and other criminals before America went to war. Heywood entered more directly into World War II as a secret weapon before he allied himself with the All-Star Squadron. In that time he was commissioned Commander Steel by British Prime Minister Winston Churchill. His membership in the Squadron was only for a brief period as Crisis on Infinite Earths caused him to shift from his native Earth-Two to Earth-One, which later became the Post-Crisis Earth. Hank retired from his superhero career, as there were no active costumed heroes at that time on his new home. Years later, as a wealthy industrialist, he incorporated the same mechanized components into his grandson in order to remake the boy in his image (there was no traumatic injury that caused a need for this). Hank Heywood III. He financed the Detroit version of the Justice League and gave them his best worker, Dale Gunn, to serve as this version of the JLA's all purpose man. When he realized that this new League didn't adhere to his now narrow beliefs, he enlisted Infinity Inc. to help him defeat them so that he could "straighten Hank out." The plan failed, and Hank suffered the indignity of being beaten by his grandson in hand-to-hand combat. They were estranged from that point on. He was there, however, to try to save young Hank's life after a vicious attack by Dr. Ivo left him broken. He couldn't save his grandson though; all he could do was be with him when they turned off his life support. After his grandson's death, Heywood resumed the mantle of Commander Steel and died battling the supervillain Eclipso, while a member of the Shadow Fighters. He did come to a heroic end - detonating the Sunburst 300 (a device meant to destroy Eclipso) as his teammate Nemesis escaped. Hank Heywood III as the second Steel. Art by Tom Derenick. The second Steel was the late Henry "Hank" Heywood III. Commander Steel, a wealthy industrialist, incorporated the same mechanized components into his grandson, much to his grandson's disapproval. Heywood III was a "Justice League Detroit" team member, and was mortally wounded in battle against an android belonging to one of the team's classic foes, Professor Ivo. His body remained preserved in the JLA Bunker until it was discovered and destroyed by Despero. Although it was originally stated that Heywood performed unnecessary surgeries on his grandson, it was later revealed in Justice League of America #260 that if he hadn't made his grandson into Steel, "Hank would have been dead... years ago." Hank later remarked that his grandfather may have been driven insane by the metal in his skull. In a Justice League of America tie-in to the Blackest Night crossover, Steel was reanimated as a member of the Black Lantern Corps in the Hall of Justice. Alongside the Black Lantern Vibe, Steel attacked his former teammates, Gypsy and Vixen, until Doctor Light destroyed him. During a later battle between the Justice League and Crime Syndicate of America at the Hall of Justice, Steel's remains were destroyed by Superwoman. The villainess even went so far as to use one of Steel's severed legs as a club, which she proceeded to use to bludgeon Donna Troy. 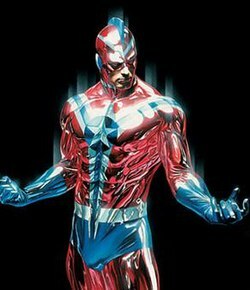 Nathan Heywood as Citizen Steel on the cover of Justice Society of America #7 (September 2007). Art by Alex Ross. The relaunched Justice Society of America features another member of the Heywood family. During an interview to Newsarama, new series writer Geoff Johns announced him as a brand new character with new powers. He debuted in Justice Society of America #2 with the name of Nathan "Buckeye" Heywood. Nathan is the grandson of Henry Heywood and cousin of Henry Heywood III. Formerly a football star at the Ohio State University, Nathan retired after shattering his kneecap and having his leg amputated due to an undiagnosed infection. The incident left Nathan addicted to painkillers. Later, it is revealed that the metal has grown out from where Nathan's amputated leg once was, forming metallic bone, muscles, and flesh. Waking in his hospital room, Nathan is shown to have superhuman strength. Dr. Mid-Nite informs Nathan that he is now a being of living steel, due to an unknown reaction to Reichsmark's blood. However, the steel tissues do not give Nathan tactile response, meaning he cannot feel textures or temperatures, nor gauge exerted pressures, and his weight has greatly increased, causing his footsteps to crack the ground. He is given a costume, a "second skin" of a stainless steel alloy developed by Dr. Mid-Nite and Mr. Terrific specifically to restrict his movements and reduce his strength to a more manageable level. They chose the costume's colors because of Heywood's heritage. He then joins the Justice Society to defeat the Fourth Reich. Afterwards, the press asks if he is the new Commander Steel. Nathan denies it, saying that he is just an ordinary citizen, so he is called "Citizen Steel" by Power Girl. When the Third World survivor Gog appears, Nathan is one of the JSA members who sides with him, hoping that Gog can restore his sense of touch. It is later revealed that Gog is rooting himself into the Earth, which would cause its destruction if he ever left, and when the unconverted JSAers battle him, they are blown away by winds created by Gog. Nathan alone is able to withstand the winds. Gog offers Nathan his greatest wishes fulfilled if he sides with him and worships him, but Nathan refuses, and joins the fight against him. For this act, Gog induces excruciating pain in Nathan. Nathan then tears off his suit and unleashes his full strength against Gog, actually managing to topple the giant, which gives Gog's former herald Magog the chance to cut off his head and send him to the Source Wall. Following Gog's defeat, Nathan takes time off from the JSA to be with his family. This consists of survivors of the attack on the reunion, various children, most of whom call him 'Uncle Nathan' or 'Uncle Nate'. During the events of Blackest Night, Nathan helps fight off the hordes of Black Lanterns attacking Manhattan. He tries to help Power Girl during her battle with the newly reanimated Kal-L, but is knocked aside by the hero, who mockingly refers to him as a "paperweight" compared to him. Following the split in the Justice Society, Nathan opted to join Power Girl's more youth-oriented team of JSA All-Stars. In September 2011, DC Comics cancelled and relaunched its entire line of monthly comics, in an initiative called The New 52, and in so doing, rebooted the continuity the DC Universe. In this new timeline, Hank Heywood Jr. appears as Captain Steel in title, Earth-2. The modern version of Hank is revealed to be a young Filipino man. It is stated that Hank was originally a young boy born with a degenerative bone disorder that would have killed him by his 18th birthday, and that his father replaced all of his bones with an experimental metal to save his life (although it also made him unable to feel emotion). During Darkseid's invasion of Earth-2, Hank's father killed himself and destroyed his research in order to prevent the Parademons from getting their hands on it. He is among those who managed to escaped the Apokolips Invasion in the following series Earth-2: World's End and found sanctuary in a newly terraformed Earth-like planet (nicknamed Earth 2) following some of their Wonders actions during the Convergence event. In Earth 2: Society, he is a member of the World Army cabinet working to maintain peace amongst the new cities of Earth 2. In hopes of preventing war from happening between two cities, Erebus and Ark Home, Hank is granted full military suppression by Commander Sato to any hostiles of both parties. Steel is blocked by The Flash, Power Girl, and Huntress. Following a small argument, the conflict is ended as Green Lantern re-purposes his power ring to become Earth 2's energy supply. Steel is among those who come into conflict with Fury and Aquawoman following the Amazonian's suggestion to use an artifact known as the Pandora Vessel to recreate the Earth back to its original state. The World Army cabinet is attacked by Ultra-Humanite's soldiers and Steel is gravely injured by a metahuman named Scalpel. Flash rescues Steel and sends him to a nearby medical team, however upon the speedsters's return to his friends, he announces Hank's nearing death, upsetting the group. Following a brief encounter with Ultra-Humanite, Fury opens the Pandora Vessel as a last resort in saving the Wonders with Earth-2 being recreated once again. Following the completion of the recreation, Earth 2 returns to its original state, however it never had a history of Wonders protecting it and Sandmen soldiers keeping everything in check 24/7. An unidentified man sporting Steel's color appears before Huntress, Batman, and John Grayson. This man is identified as Sergeant Steel and is the first and last member of a super soldier program called Americommando. He is the leader of an underground movement of concerned citizens and ex-servicemen hoping to build up strength to fight back. He takes in the three Wonders in hopes that The Movement can finally strike. After the Ultra-Humanite incident, Sergeant Steel joins the Wonders in protecting their new Earth. 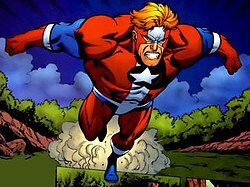 Originally Commander Steel could lift 1,000 pounds, but when he appeared in the pages of the All-Star Squadron, he was attributed 'super-human' strength without an exact limit. Citizen Steel's metallic body grants him superhuman strength and allows him to take direct blows from opponents as powerful as Gog, and remain standing, and in turn knocking him to the ground—the only one in the JSA able to do so—but at the cost of reducing his sense of touch so that he cannot really feel anything he comes in contact with, making it hard for him to judge how much effort he should put into doing things. His alloy suit limits his strength to controllable levels but at a cost of slowing him down, as well as making him so heavy that he has been shown cracking pavements just by walking. Upon removing his suit, he is able to unleash his full strength without a speed penalty. Dr. Nathaniel "Nate" Heywood / Steel appears in Legends of Tomorrow, starting from the second season, portrayed by Nick Zano, while his grandfather Henry Heywood / Commander Steel is portrayed by Matthew MacCaull. Initially a hemophiliac, he is injected with a super serum provided to the Nazis by Eobard Thawne after it is modified by Dr. Ray Palmer, turning Nate into a metahuman with an ability to transform himself into a steel-like form in addition providing him superhuman strength. Having obtained his powers, Nate starts calling himself "Steel", although one of his original suggestions is "Citizen Steel". It's later revealed by Obsidian to Nate that his grandfather went on a mission with his team excluding himself, and never returned home in 1956, a year after Nate's own father was born. Nate gained his own Steel suit at the end of the episode "Outlaw Country". In the episode "Raiders of the Lost Art" it's shown that Nate became a historian because as a child he saw the Indiana Jones series, with a temporal aberration nearly causing Nate to become a yoga instructor because George Lucas abandoned filmmaking after an attack. In "Moonshot," Commander Steel is revealed to be in 1970, becoming a flight commander for NASA and one of the guardians of the fragments of the Spear of Destiny, which he managed to hide on the moon. He also rigged a competition to let his then-teenage son, Hank Heywood come to NASA so he could hopefully meet him. Henry though later sacrifices himself by opening up the hatch doors to the Waverider to save the Legends and was sucked into space. Afterwards, Nate passes on a message that Henry left to the young Hank and gave him his father's dogtags, which he would eventually pass down to Nate someday. Nick Zano also portrays Dr. Nathaniel "Nate" Heywood / Steel in the Arrow episode "Invasion!" which is the second of three parts in the 2016 Arrowverse crossover event. Hank Heywood appears in the fourth season of Legends of Tomorrow, portrayed by Thomas F. Wilson. He is the father of Nate Heywood, the son of Henry Heywood and the primary funder of the Time Bureau, where the Legends are employed. He is unaware that his son is a superhero until the episode "Witch Hunt." 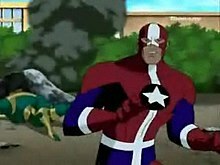 Commander Steel in Justice League Unlimited in the series finale episode "Destroyer". Hank Heywood III appeared several times as Commander Steel in the Justice League Unlimited series. He was voiced by Kevin Conroy. A Mattel action figure in the character's likeness (presumably called "Commander" Steel to differentiate him from the better known, current version of Steel, already a figure in the toyline) was released. In the series finale episode, "Destroyer", he saved Hawkgirl from being killed by a Parademon by throwing a shield at it in reference to Captain America (who shares some similarities with Commander Steel). Also in "Destroyer", he is seen running down the Metro Tower stairs with Vibe, Vixen, and Gypsy, the four members of the Justice League Detroit era created by Gerry Conway. In Batman: The Brave and the Bold episode "Powerless", he is referred to as Aquaman sings his rousing song of heroism he appears as Commander Steel as one of the heroes. The original Commander Steel, Henry Heywood, was the first figure released in the eighth wave of the DC Universe Classics line. Commander Steel was also released through the Mattel Justice League Unlimited line, coming in a six-pack with Superman, Crimson Fox, B'Wanna Beast, Deadman, and Vibe. ^ Manning, Matthew K. "1980s" in Dolan, p. 209: "The prestigious Justice League of America got a bit easier to join, thanks to writer Gerry Conway and artist Chuck Patton. Marking the debut of camouflaging hero Gypsy, the shockwave-casting Vibe, and the second generation hero Steel, this landmark comic saw many of the more famous League members step down in order to make way for a younger roster to carry on their legacy. ^ a b c Wallace, Dan (2008). "Commander Steel". In Dougall, Alastair (ed.). The DC Comics Encyclopedia. New York: Dorling Kindersley. p. 86. ISBN 0-7566-4119-5. OCLC 213309017. ^ "Newsarama". Archived from the original on 2007-02-07. ^ Andreeva, Nellie (June 15, 2016). "'DC's Legends Of Tomorrow': Nick Zano Joins As New Hero With Steel Pedigree". Deadline. Retrieved October 7, 2016. ^ Abrams, Natalie (August 4, 2016). "Legends of Tomorrow books iZombie villain as Commander Steel — exclusive". Entertainment Weekly. Retrieved October 7, 2016. ^ "Commander Steel in "Destroyer"". Youtube.com. Retrieved 2011-01-15.